Tax laws vary from country to country and you need to get clear, professional advice, not least due to the fact that the Italian tax system is quite complicated. The purchaser shall be provided with an Italian Tax Code issued by the Revenue Office (Ministry of Economic Affairs). The Deed of sale is subject to registry tax + VAT (10% of the property purchase price). Submit to the Italian Revenue Office the income tax return “Modello UNICO”. 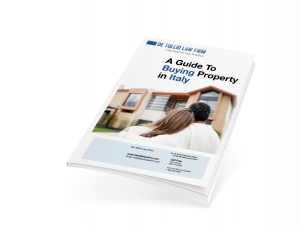 (If you are not an Italian resident, you need only declare income generated from real estate assets in Italy. If you are an Italian resident, all income generated in Italy and abroad must be declared). Payment of Irpef (personal income tax) on the cadastral revenues (income calculated on the cadastral revenue in case of direct possession) or on the actual income (where the property is rented to third parties). The Irpef quota is proportional to the income (on average it amounts to 25/35% of the income declared). Irpef is paid in 2 instalments in June and in November. The cadastral income depends on the value of the property and it is more or less equivalent to one hundredth of the cadastral value (for instance, value of the building Euro 200.000, cadastral revenue Euro 2.000, Irpef Euro 460), whereas the actual income will depend on the rental fee paid to the property owner/landlord. The IUC is a tax introduced by 2014 Stability law. It includes taxes and levies due in relation to home (IMU) and to waste production (former Tia and Tarsu and TARES): originally named TRISE, in the Government’s maxi-emendamento (amendment) approved by the Senate, its name was changed to IUC (Imposta Comunale Unica, meaning Unique Municipal Tax). This tax is composed of more parts: IMU on property possession (excluding first homes), TARI on waste production and TASI, covering indivisible municipal services (lighting etc. ), with a share to be borne by tenants. Therefore, IUC is a composite Service Tax, to be paid both for the possession and for the rent of a property, applicable both to owners and to tenants. All the IUC details, updates and deadlines. The Payment of TARES (disposal of municipal solid waste tax) will now be subsumed into the “Service Tax” a component entitled TARI which will cover the management of municipal waste, this tax will be calculated according to the size of the property. Tax will vary from comune to comune with some flexibility. The second component of the Service Tax will be the TASI, which covers other services provided by the municipality (maintenance of public parks, street cleaning, lighting etc.) to be paid by those who occupy housing, shared by both the owner and the occupant in rented property. The theory being that local public services contribute to the market value of the property and the occupant in turn benefits the local services. Each Municipality will be able to decide whether to base the tax on the surface area of the property or the cadastral value. An upper limit will be placed on taxation but each Comune will be given a degree of freedom in setting the rates. It would be extremely advisable to obtain professional expertise in tax matters. In Italy, the professional entitled to deal with such issues is a commercialista – an accountant with a degree in Economics (Chartered Accountant).